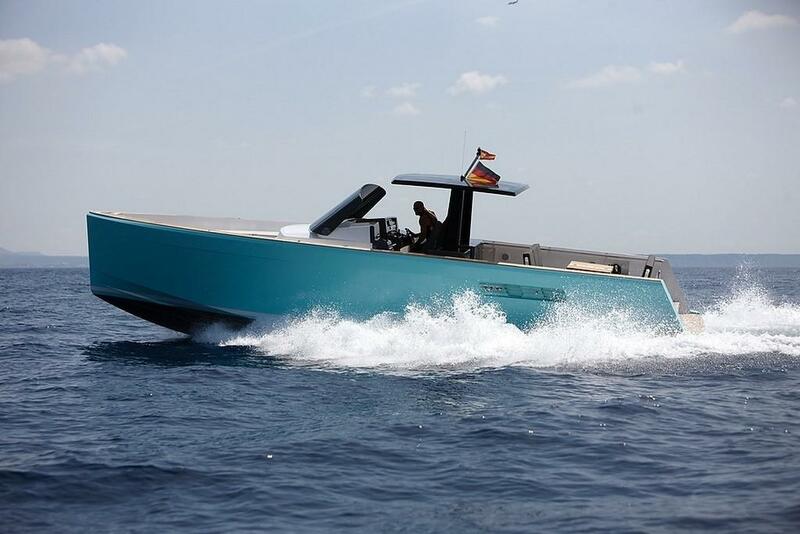 The Fjord 40 Open was the first Yacht built by the Hanse Ship Yard with the participation of “Allseas Design” studio. 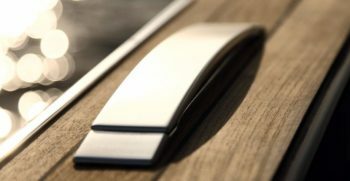 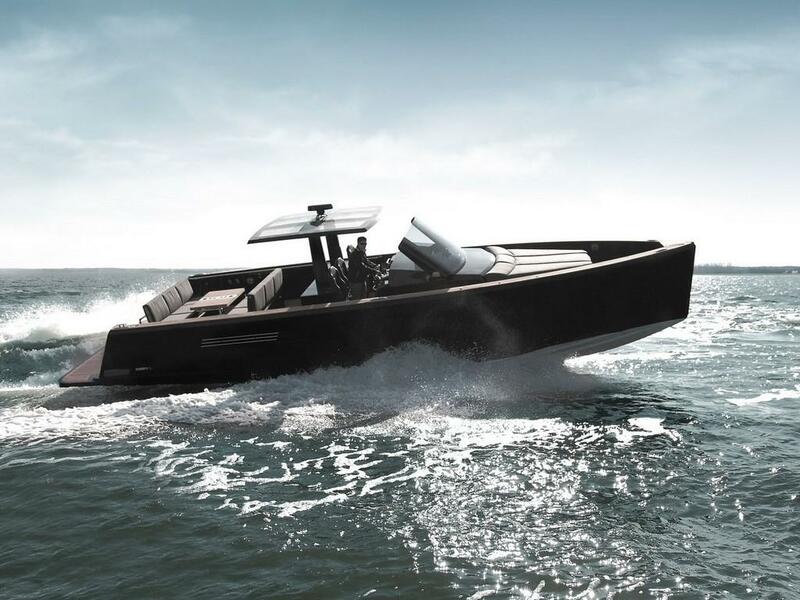 After the collaboration with “Wally”, the design studio of Patrick Banfield developed a whole new concept in unison with the German Ship Yard. 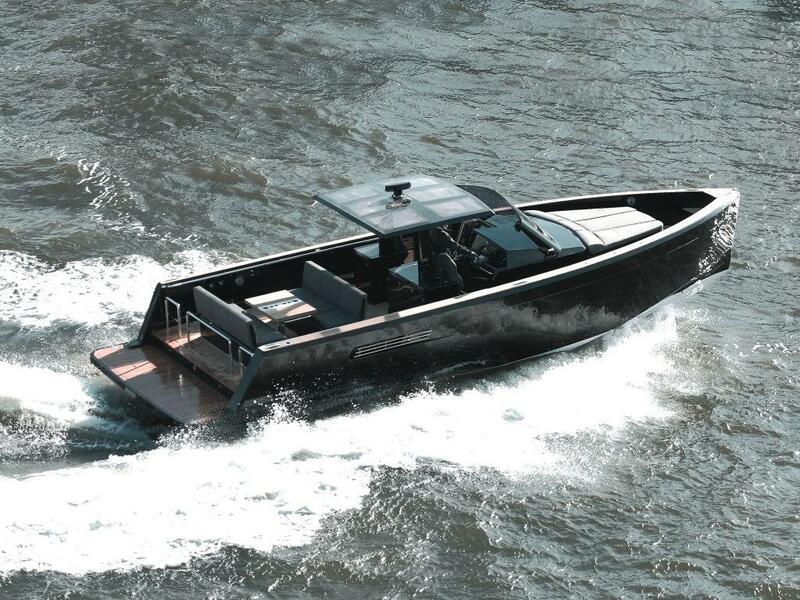 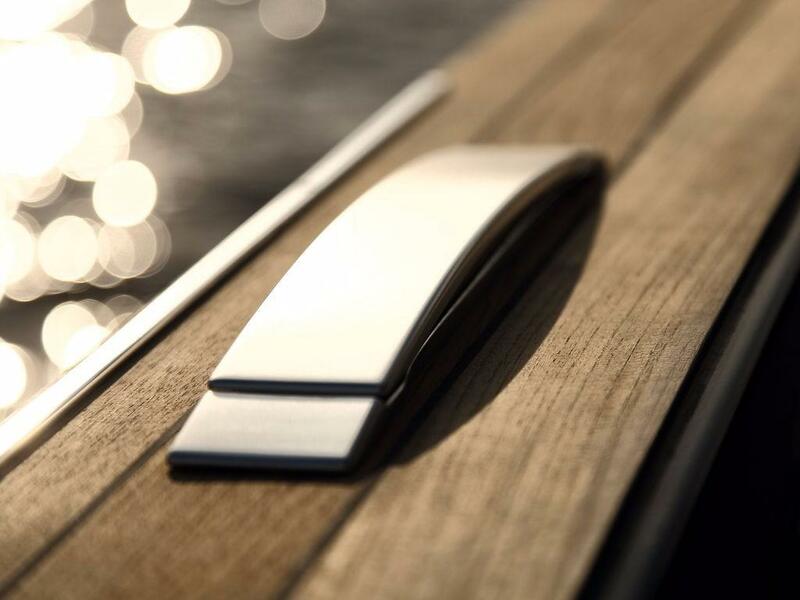 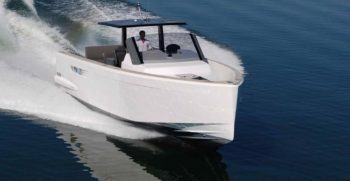 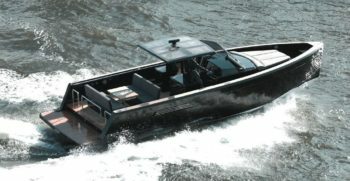 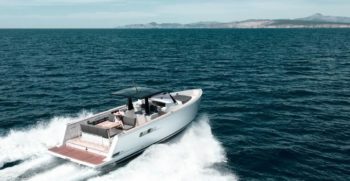 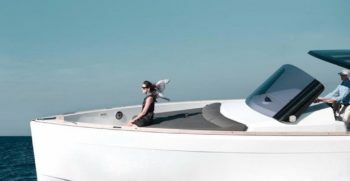 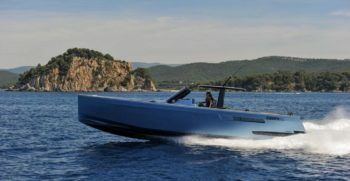 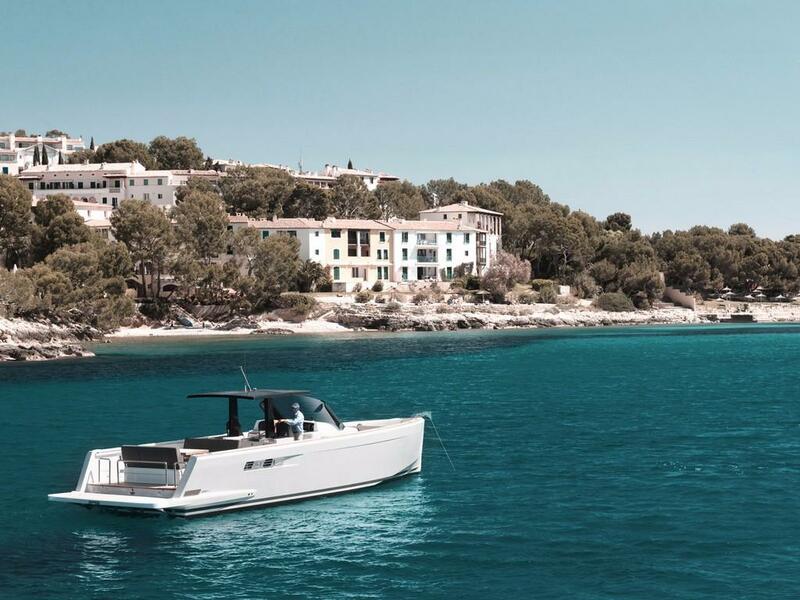 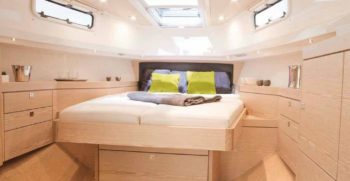 The Fjord 40 Open has taken luxury day cruising to another level by building an extremely practical and striking vessel. 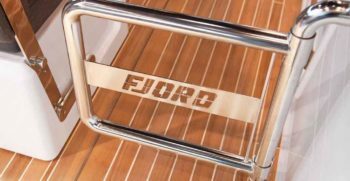 This success story has paved the path for a fleet of Fjords ranging from 36’ to 52’. 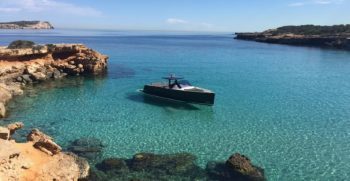 The timeless design of the 40’ still attracts the attention of even the very young and offers practical solutions to those who wish to enjoy high quality day cruising and return home at dusk. 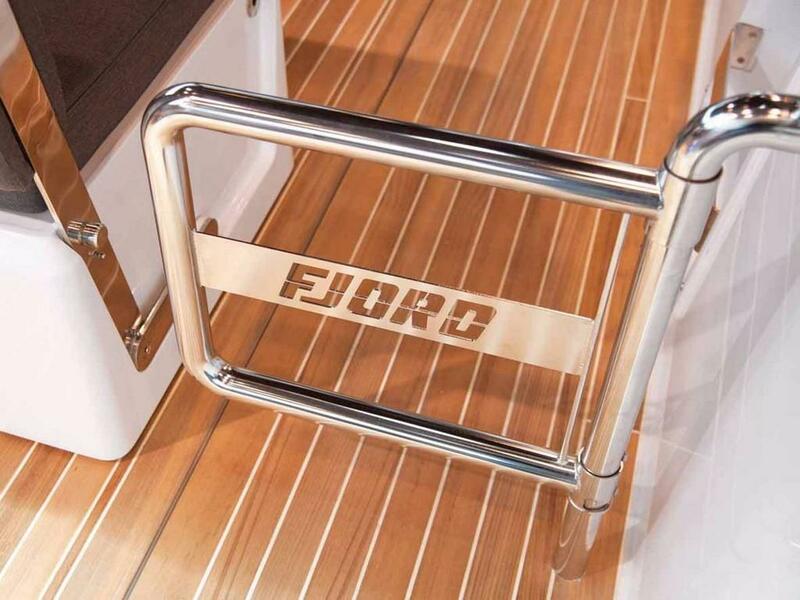 Life on board the Fjord happens mainly on deck. 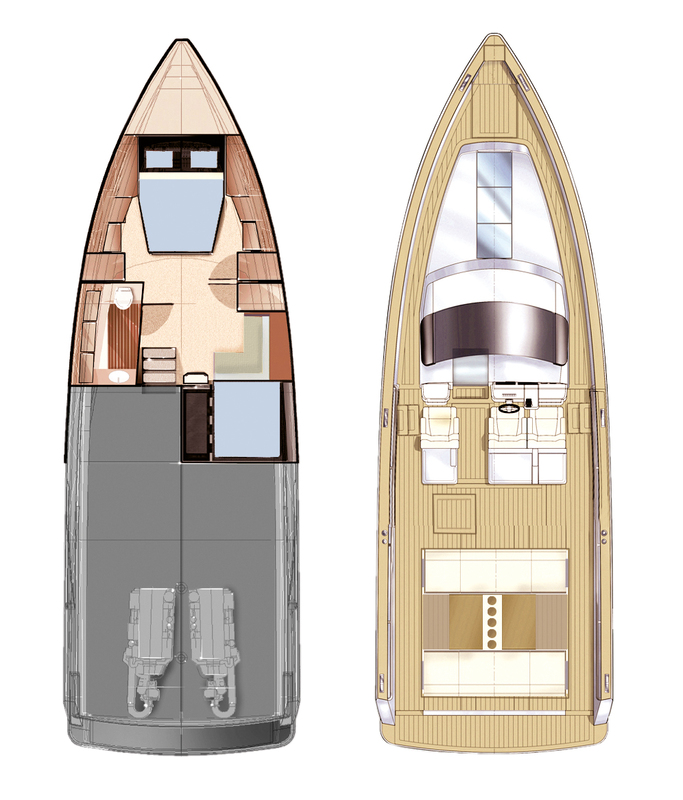 The excellent lay out and diaphanous space divide this vessel into five well defined areas. 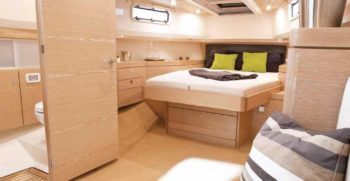 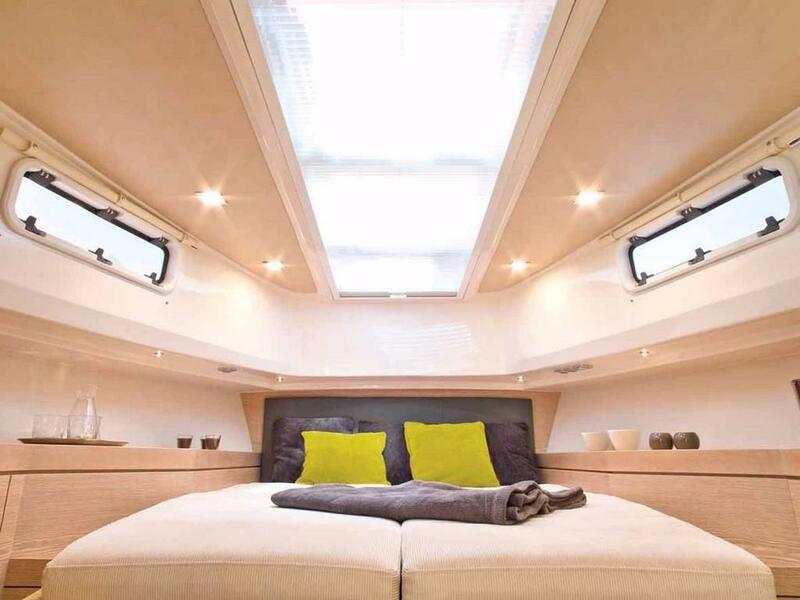 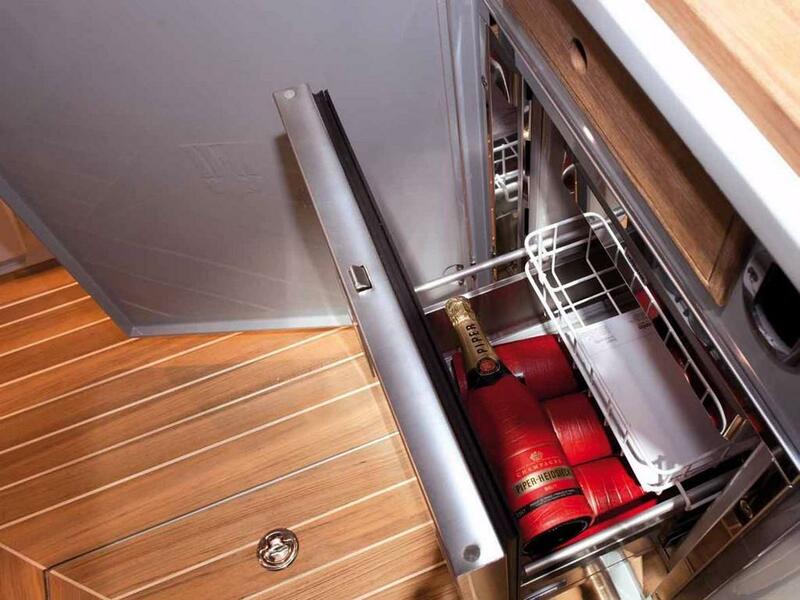 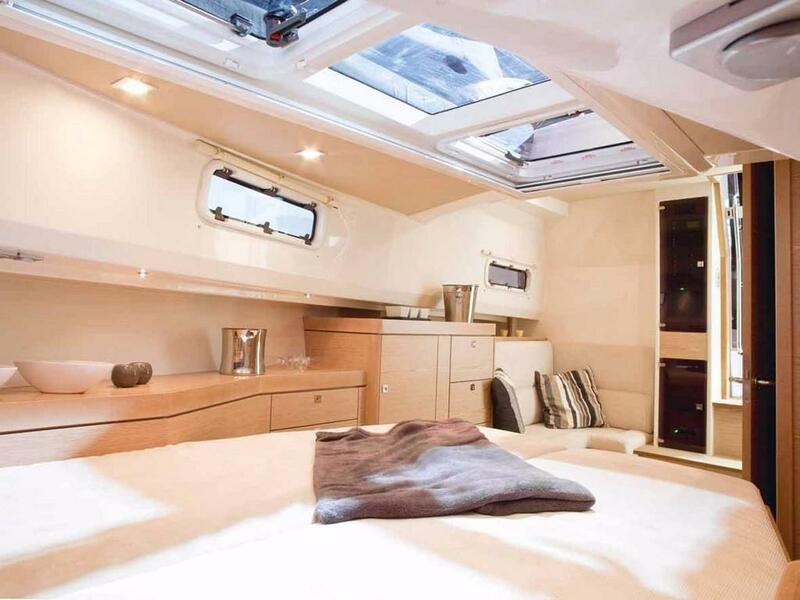 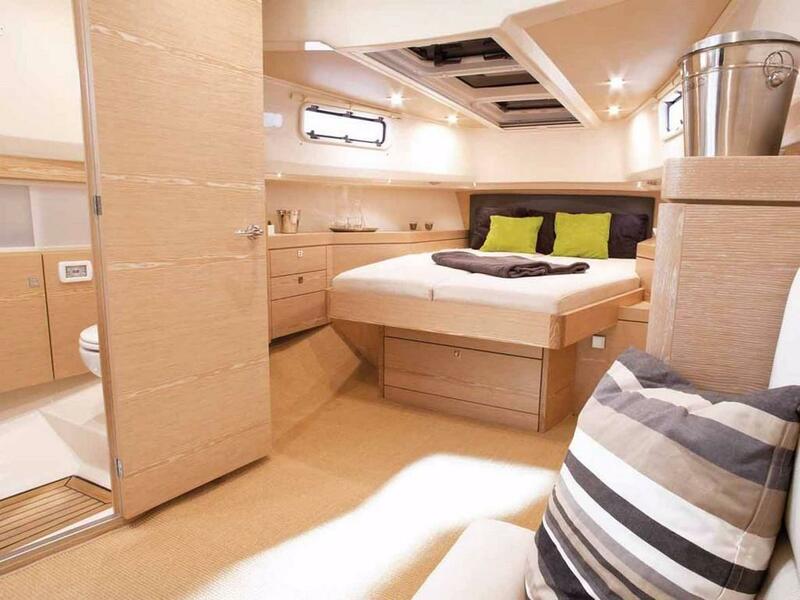 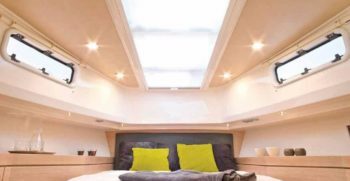 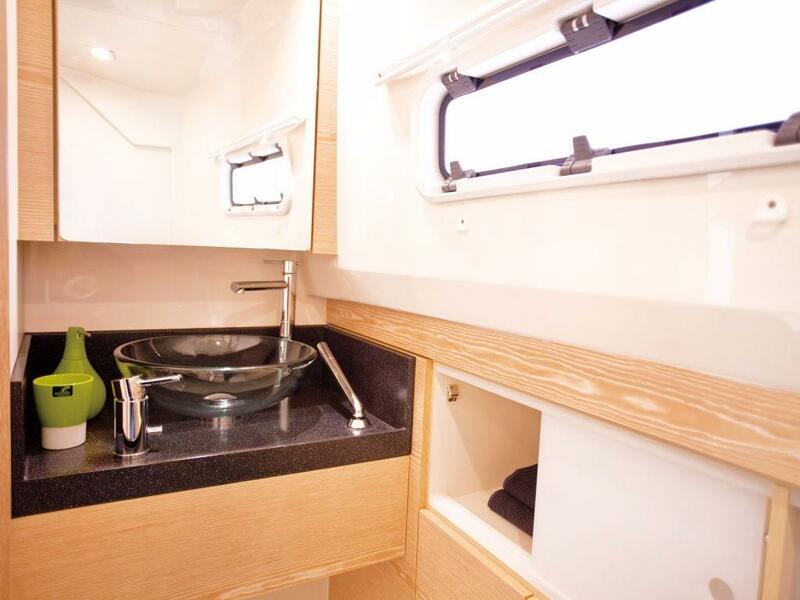 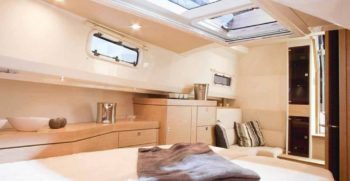 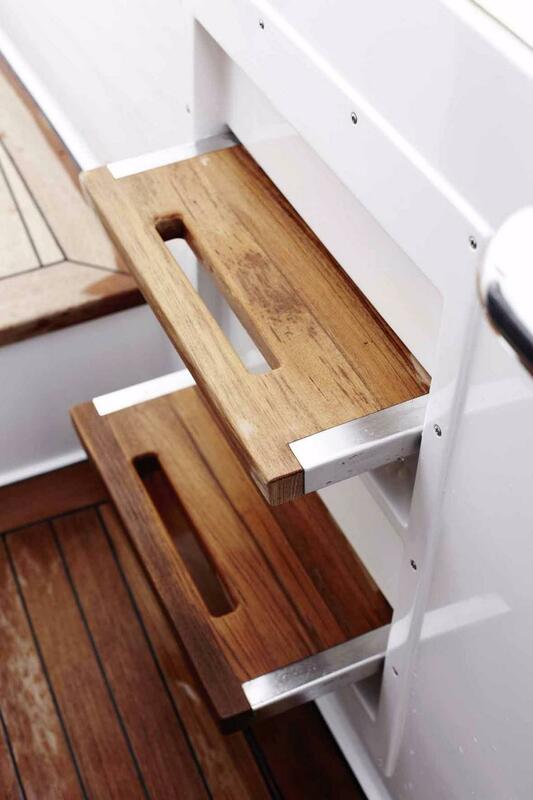 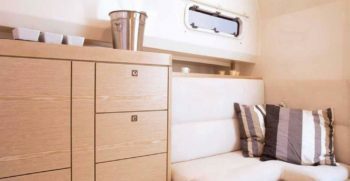 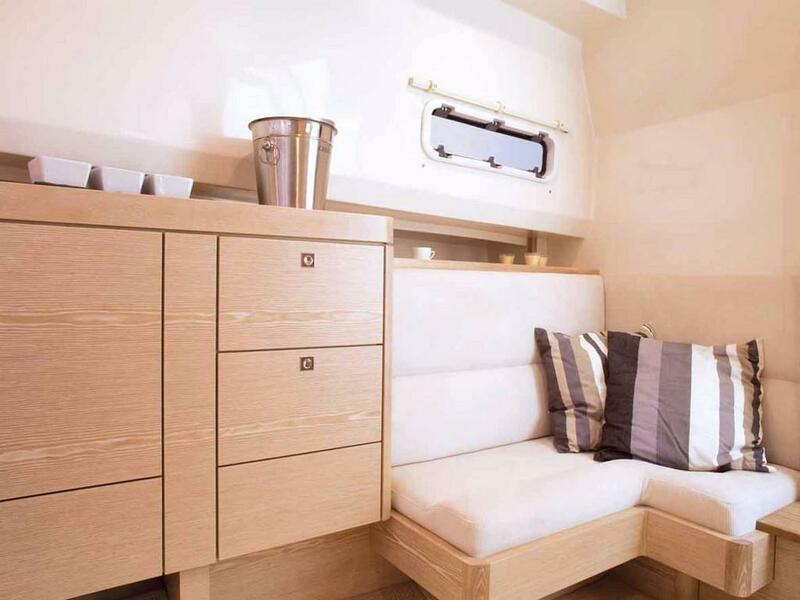 A generous Bathing Platform, Convertible Dinette, Galley, Helm Position and Forward Sun pad. 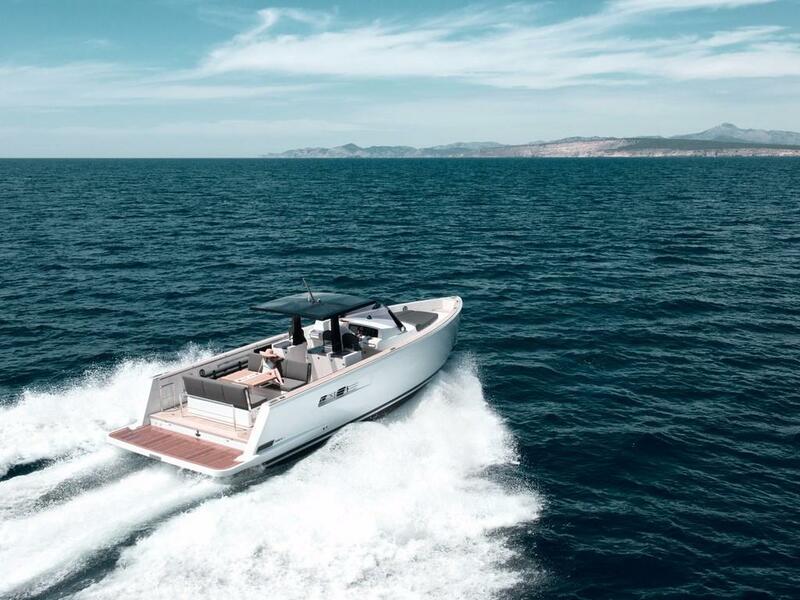 Whether you are just going out for a swim or spending all day on board, the Fjord 40’ Open shows its potential right from the start. 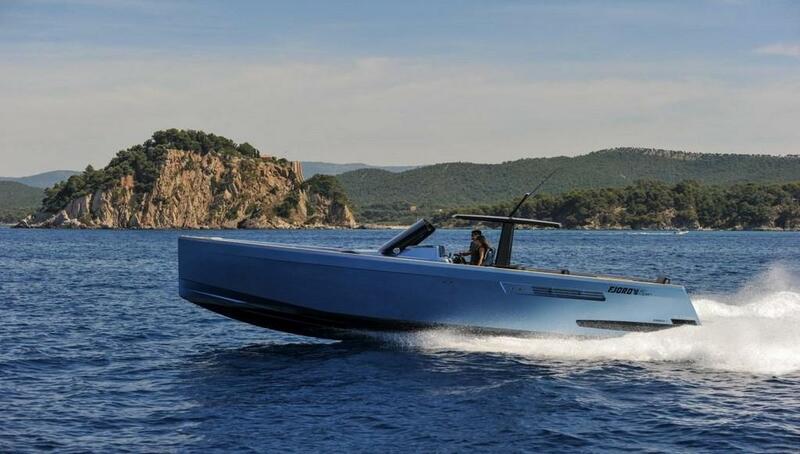 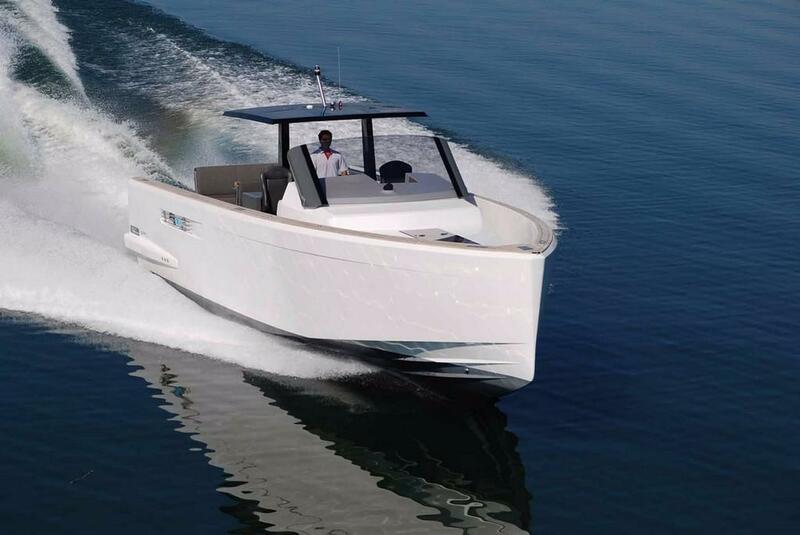 IPS drives and a Joystick make this Yacht very easy to maneuver. 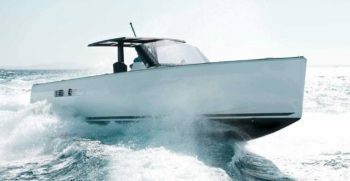 One person alone can handle the boat comfortably. 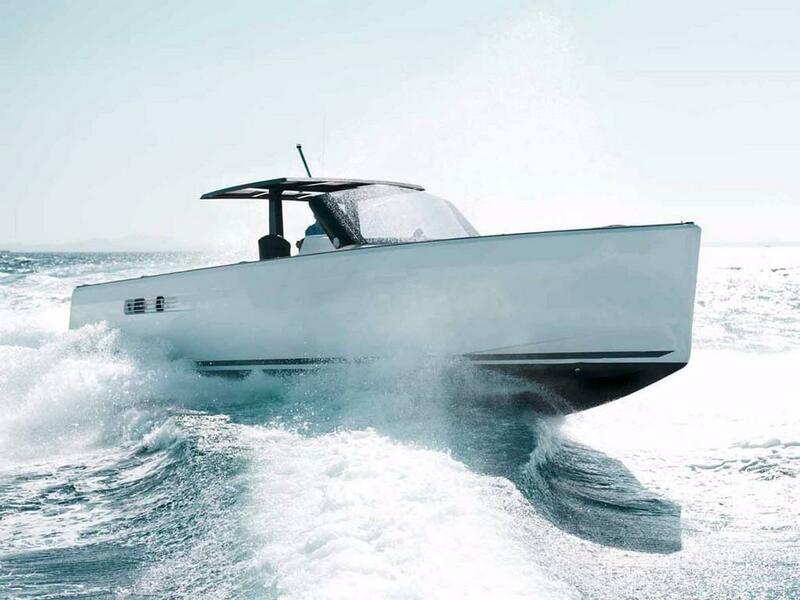 The fuel efficient Volvo Penta IPS engines give you a cruising range of over 200 nautical miles at 25 Knots. 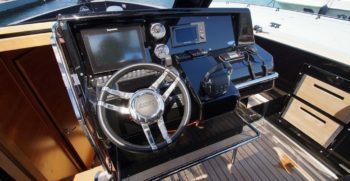 The choices are IPS 500 or IPS 600, the main difference being the top speed. 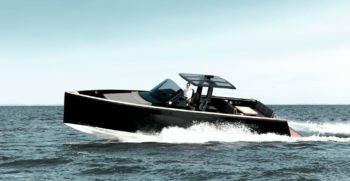 The IPS 600 will clock 40Knots. 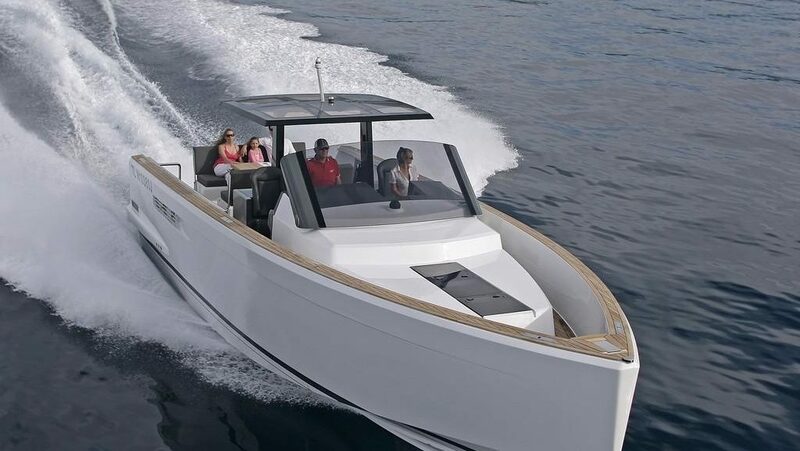 The Fjord 40’ Open feels solid and stable at any speed resulting in a comfortable and relaxing ride. 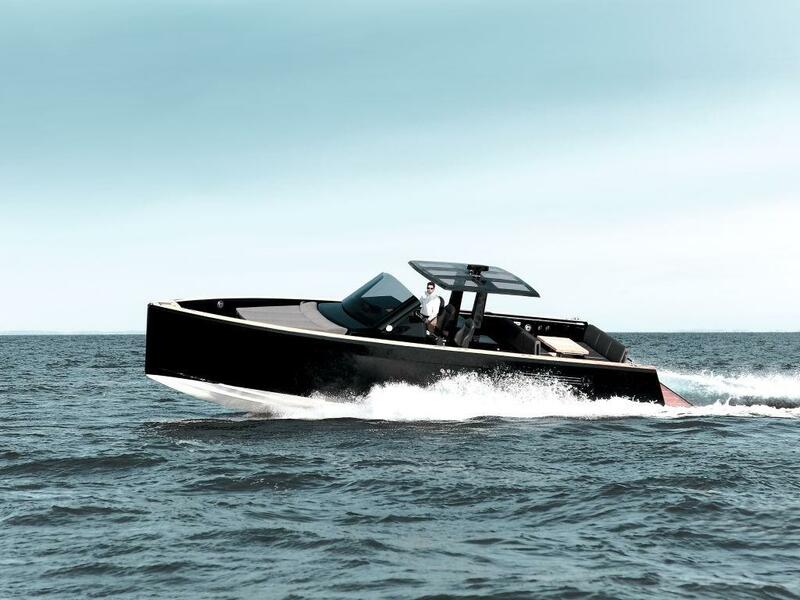 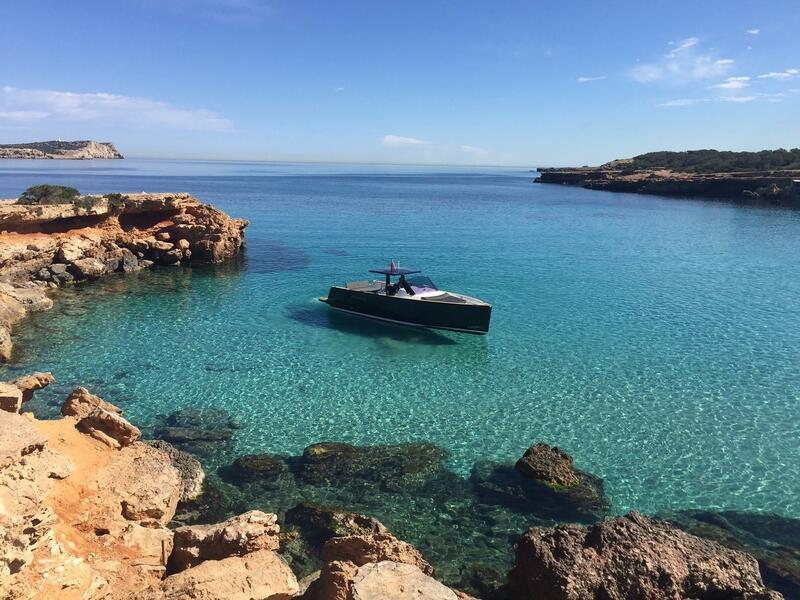 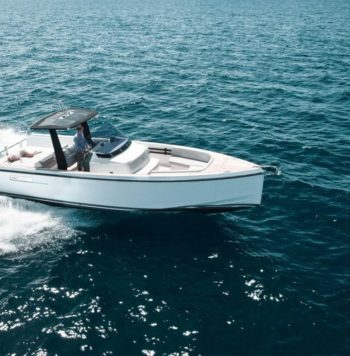 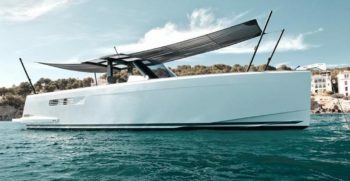 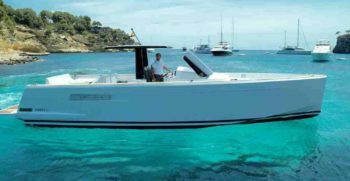 Thanks to its advanced hull design the Fjord 40 rides high on the water avoiding the sea spray making it a particularly dry boat. 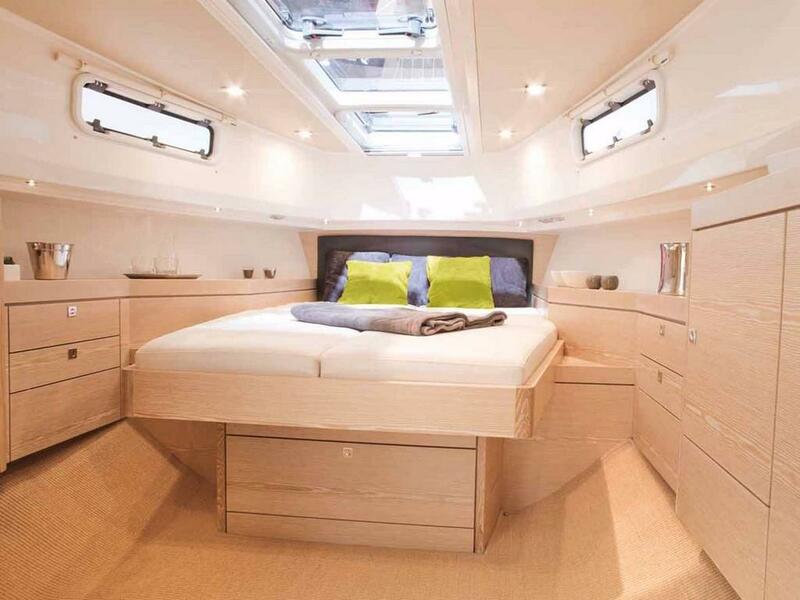 The wide and tall windscreen shields the Helm seats and the galley and also the forward seats of the cockpit table. 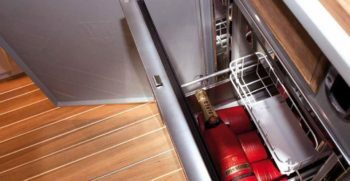 On the main deck the walk around gives a feeling of security and allows guests to move from bow to stern safely. 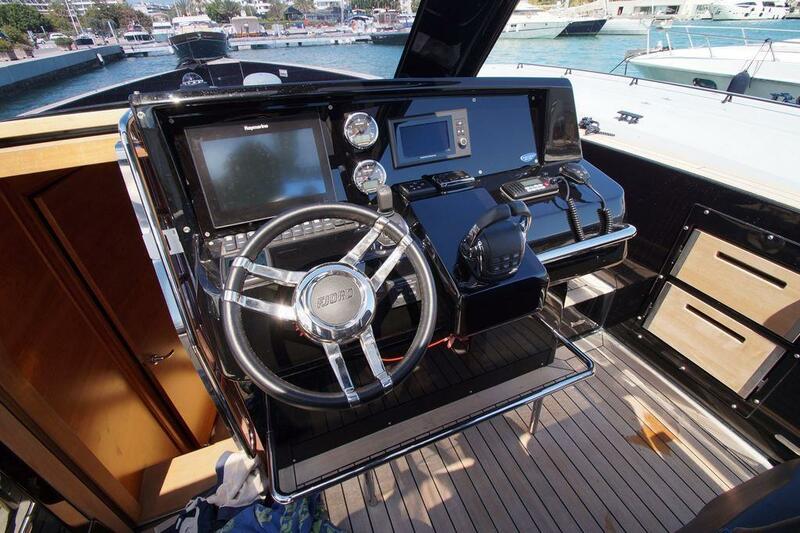 Both young and old can move comfortably around the center console or the cockpit table without running into each other. 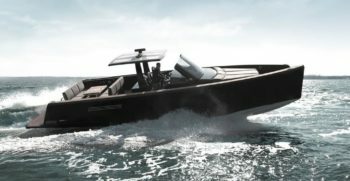 The rigid T-Top shelters the Helm and three foldable seats that give you the option of driving either standing or seated. 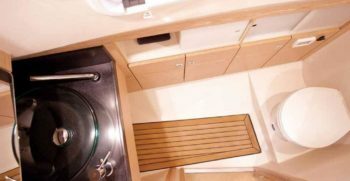 The Galley is also located under the T-Top. 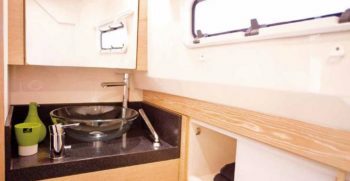 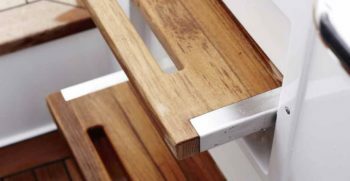 The generous work surface allows you to prepare a Cocktail or a Sandwich next to the cockpit table without missing out on the fun. 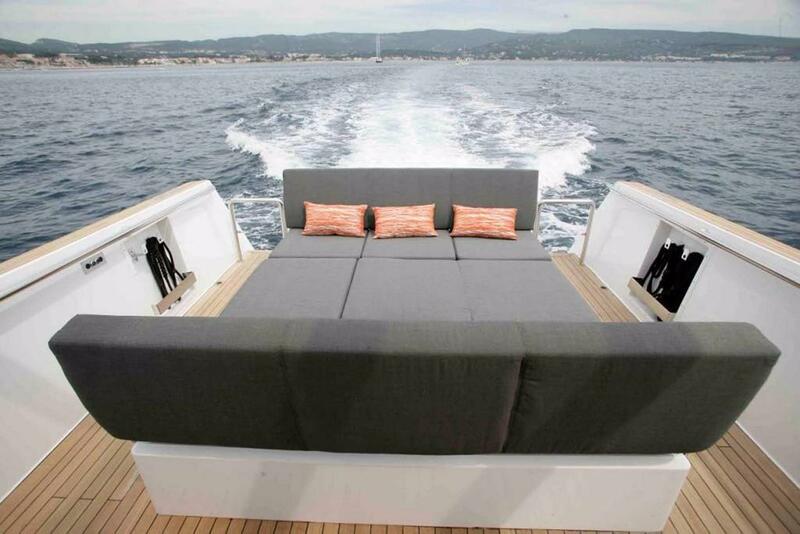 The cockpit table which seats eight guests comfortably can be easily converted into a large Sunbed at the touch of a button. 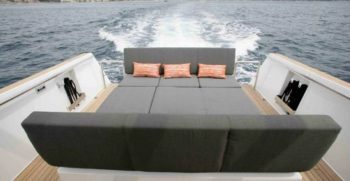 Both Sunbeds Forward and Aft have optional micro perforated Biminis to provide shade on hot summer days. 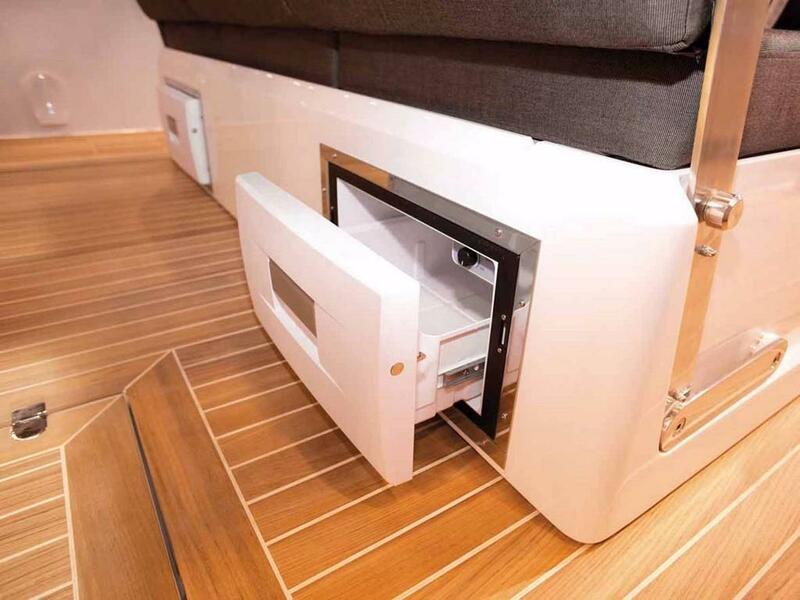 Indoors the L shaped sofa converts into a second berth. 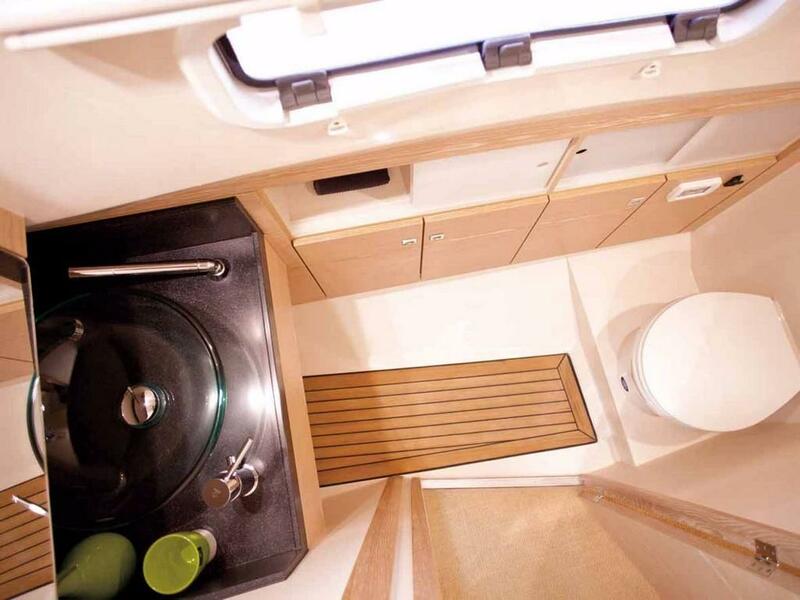 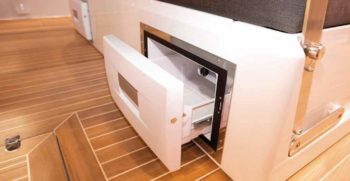 The full height independent bathroom is also a great feature of privacy allowing you the comfort and facilities to stay out at anchor for a couple of nights to enjoy the Mediterranean Sunset or the Magic of a summer night in a secluded cala. 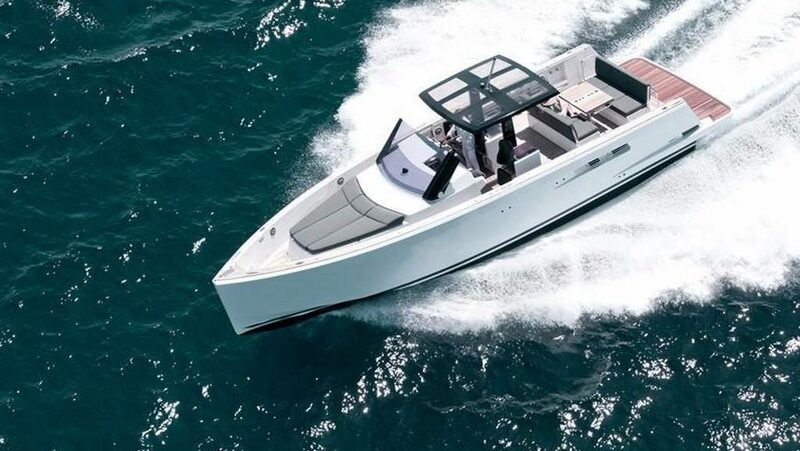 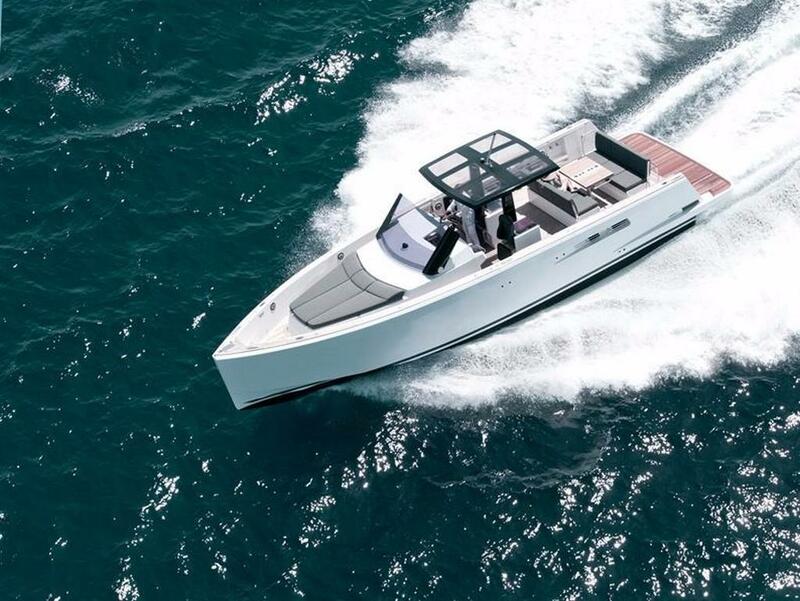 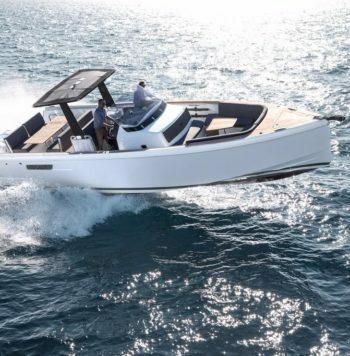 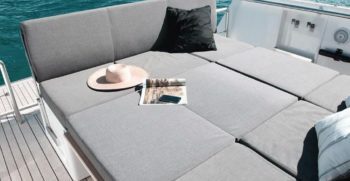 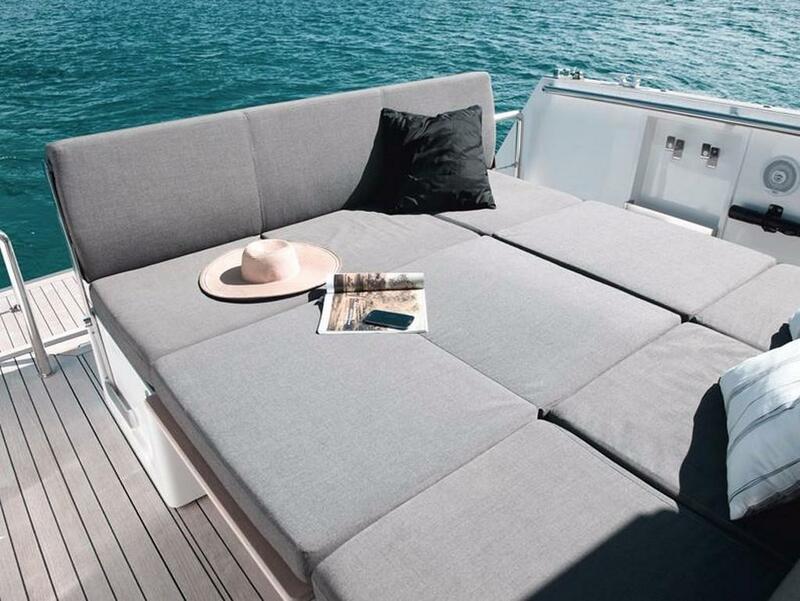 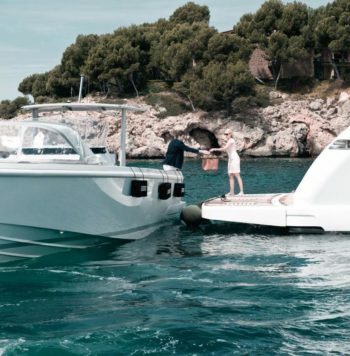 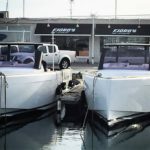 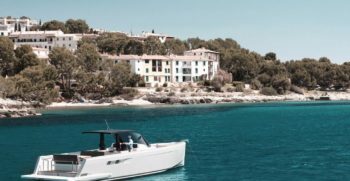 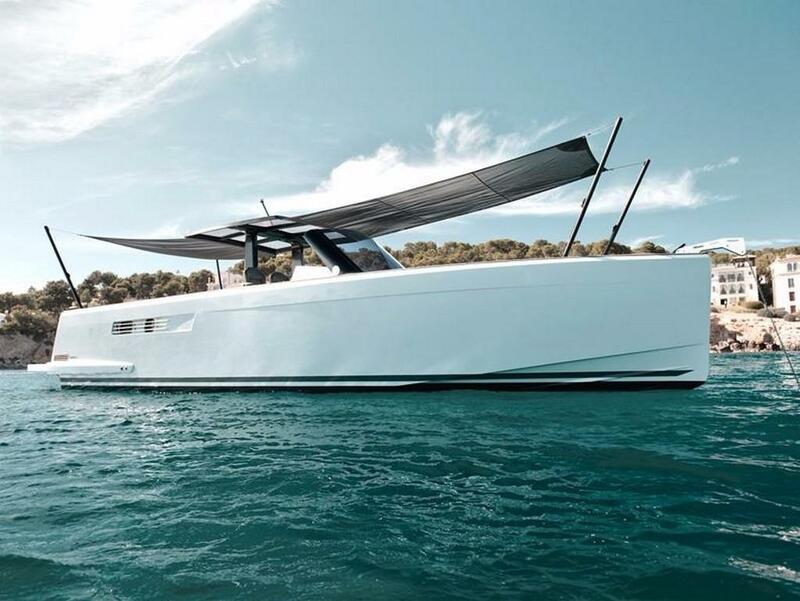 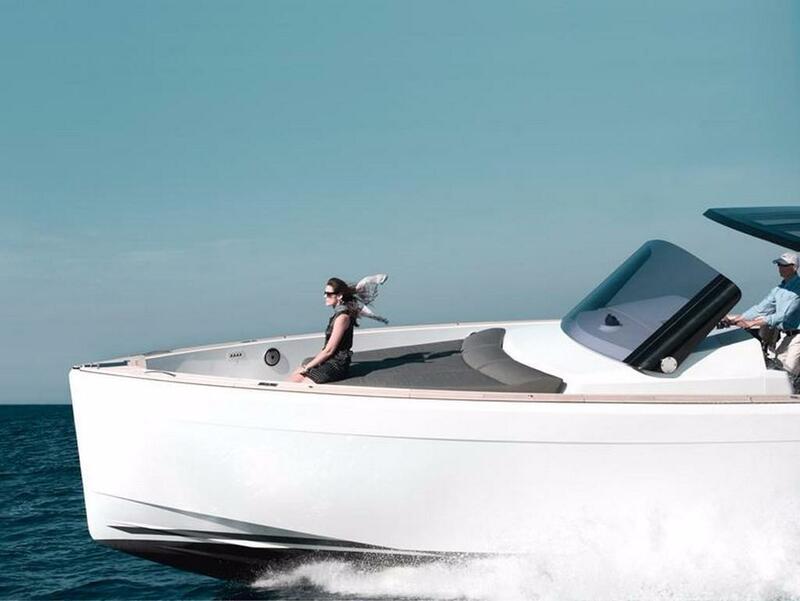 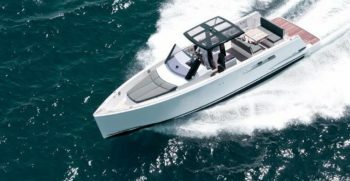 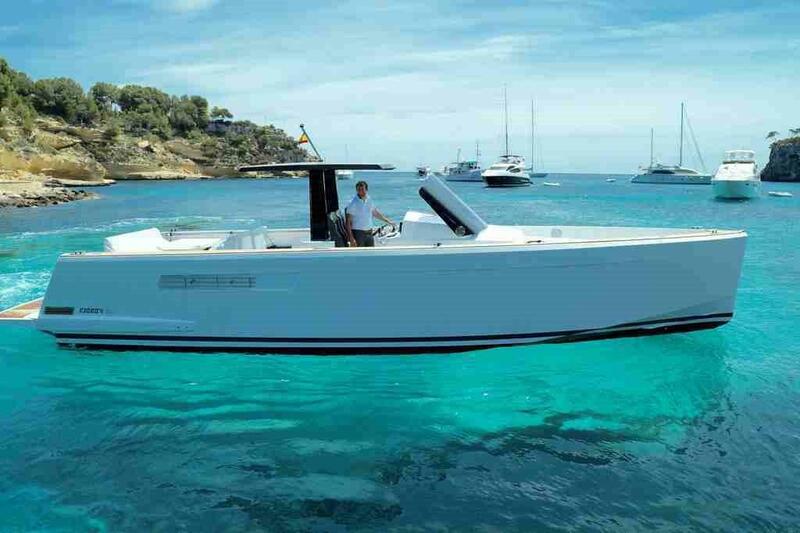 The Fjord 40’ Open has set a trend in luxury Yachting by creating the perfect day cruising boat.